Welcome to the ninth issue of the Columbia College Class of 1963 eNewsletter. Homecoming Weekend brought quite a few of you back for the class lunch on Friday, October 14. Unfortunately, not many made it back to the game. Several of you at lunch observed that you had come to New York to enjoy yourselves, and therefore were avoiding the game. Shame on you (Columbia lost, don't ask me by how much). Although I'm sure that Tom O'Connor was there with the football alumni, I never was able to get together with him. I'm sure there must have been a whole bunch of you in the new tail-gating area, but I never got there. Phil Satow, Bruce Kaplan, and Gerry Dwyer and his wife kindly visited me at the lonely class of 1963 table in the Big Tent at Baker Field before the game. So here are our pictures to prove we were there. I hope next year we will have a terrific turnout! I hope that you are finding this eNewsletter interesting, I have had a great time hearing from all of you. Judging from the number of people who have been asking me to put them in touch with old friends mentioned here, I think that many of you share my desire to reconnect with old friends. I have heard from close to a hundred of the you since I started as your class correspondent a year ago. The class luncheon in New York has been attended by over 30 of you, and many of you have become regulars. I hope many more of you will attend. Keep those notes coming, and share with us your memories and your recent news. Special Date for Lunch (this month only) Wednesday, November 9, 12:30 p.m. to 2:00 p.m. Please join your classmates for an informal lunch at the Columbia Club every second Thursday of the month (this month this falls on a Wednesday). It is our hope that these gatherings will renew old friendships and foster improved relationship with our class and the College. Because of the Homecoming Weekend, the next lunch will be on Wednesday, November 9, 2005. The ninth Second Saturday Class of 1963 lunch was held on October 14. For the first time, the doctors showed up in force (and they came from out of town) to outnumber the lawyers. Michael Erdos, Peter Broido, Henry Black, and Harvey Schneier making it in from out of town (Boston, Chicago, Chicago, and his office in Jersey City, respectively). My old roommate, Frank Partel finally made it in from his home in Bryn Mawr before retreating to winter quarters in Vero Beach. And regulars, Doron Gopstein, Tom O’Connor, Bob Heller, and Paul Neshamkin also enjoyed the day. Here is the fine gathering. The first image was taken with Peter Broido's camera (and he looks better), the second with mine (and I look better). 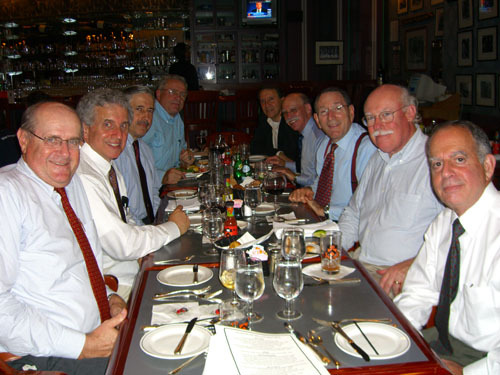 (From left to right) Frank Partel, Michael Erdos, Doron Gopstein, Tom O'Connor, Harvey Schneier, Henry Black, Bob Heller, Paul Neshamkin, and Peter Broido. I took several other candid shots, which you can find by following this link. I hope you can all join us (please encourage your friends to come with you) at the next lunch on Wednesday, November 9. Let me know if you will attend so that we can reserve a big enough table; RSVP to Paul Neshamkin (pauln@helpauthors.com). Very slim pickings -- I hope you guys are not getting bored. I know you're not because a lot of you write to tell me how much they enjoy reading the notes. Naturally, they don't add any of their own. Please take a minute to fill your classmates in on the news. Here is a selection of the unedited (and unexpurgated) notes and news that you have sent in the last month. Larry Neuman is very actively involved with the development of renewable energy (wind and solar) projects from New Jersey to the Galapagos. After his Ph.D. from Lamont Doherty Earth Observatory, he spent 17 years at the United Nations on marine and energy resource development. Larry is based in New York and welcomes any questions about this booming field. You can reach him at lneuman@nyc.rr.com. Larry’s wife Ursula is curator of contemporary craft and jewelry at the Museum of Arts & Design in New York. Their son Andreas (’98) has just been promoted to Captain in the US Air Force and is currently deployed in Qatar. Michael Goldman writes: "I appreciate receiving these email newsletters and thank you for the effort of putting them together. My initial reaction to the luncheon photos was 'Who are these old guys, and what do they have to do with me?' Then I looked in the mirror . . . One of the odd but nice things about teaching is that the people you interact with never age, so it's easy to forget that it's been over forty years since leaving Columbia. Living as I do in Ohio, where I am entering my final year of teaching philosophy at Miami University, my trips to New York are either visits to the few family members who remain there, or to occasional professional conferences. So it's been decades since I've visited the campus. I was surprised and delighted to see in the latest "hard" mailing how the living accommodations have grown! I remember two of us being squeezed into a 10'x15' room in what used to be Livingston. Now that my daughter has taken a position with the American Civil Liberties Union in the city I will have more reason to visit and will make a special effort to see for myself." I remember returning to campus one evening in 1960 or 61. It was about midnight, probably in the middle of the week. Butler Library was on my right, and arrayed on all sides were the fine old McKim, Mead and White buildings. In every one of those buildings lights were on, and I was suddenly struck by the thought that all around me chemists and poets, sociologists and philosophers, physicists, historians, engineers and scholars of every sort were laboring well into the night on a common project: the struggle against ignorance, poverty, disease, war, prejudice, famine and all sorts of human misery. It was an incredibly, if naively, optimistic thought, and also an incredibly inspiring one, for here I was, a part, albeit a small part, of this tremendous project. In retrospect it is easy to diagnose this emotional response as a product of the post-war 'end of ideology' era, and surely the history of the last half century has made a mockery of that foolish optimism. Nonetheless I find it impossible wholly to rid myself of it, and in the deepest recesses of my emotional economy it still provides a bit of inspiration. Even if there were no other reason to be grateful for my Columbia education, this would be more than enough." Phil Friedman Writes, "My web site address was listed mistakenly [in the last eNewsletter] as www.integrativehealing.com when the correct one is www.integrativehelp.com (probably my mistake) or www.philipfriedman.com. My email address is PhilF101@comcast.net. Bruce Kaplan and his wife Ann Hall Kaplan celebrated their tenth wedding anniversary this Spring. “Between us we have four children, Matt Kaplan of Las Vegas, Amy Benton of Quakertown PA, Ken Benton, currently in his second year at Emory Law School in Atlanta, and Evan Kaplan of New York. Both Ann and I are active in full time careers, Ann is Director of Development at St. Bartholomews Church in Manhattan, and I am am a litigation partner in the firm I started twenty years ago, Friedman Kaplan Seiler & Adelman LLP, which has now grown to fifty lawyers. Frank Sypher has had another book published recently, Letitia Elizabeth Landon: A Bibliography (Ann Arbor: Scholars' Facsimiles & Reprints, 2005), is the 15th volume in his series of books by and about this early 19th-century British poet and novelist (1802-1838).